I understand that when mesh overlaps with the capsule the bone name is none. However , it also overlaps the skeletal mesh inside the capsule so there is no reason to not have a bone name. Whats more disturbing is even the location and impact point return zero vector. As such how would you proceed on making a game where its important to know which bone of your character hit which bone of other character? Can you show me your BP graph? I will be taking a look into this issue early next week. Component overlaps are determined using PhysX sweeps. 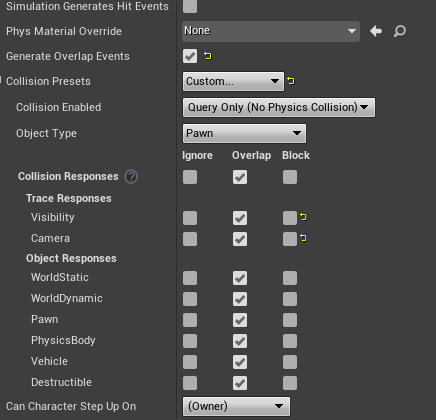 PhysX doesn't inherently know about Bone Names, but FBodyInstance (which is the user data we pass through) has the notion of Item Indices. On skeletal meshes, these map directly to bones. Additionally, in order for ItemIndex / OtherBodyIndex to be properly set, you'll need to have bMultiBodyOverlap enabled on the other component. So, in the example project you uploaded, you need it enabled for NewBlueprint's SkeletalMesh component, but not for ThirdPersonCharacter. Finally, this will cause each bone to generate overlap events as they are each considered their own physics body. This means that as you run through the skeletal mesh with the cube you'll notice several events occurring (one for each bone) as opposed to the single event you currently see. If you need bone information, you'll have to manually filter and ignore these events (something like checking to see if you're already overlapping the given actor, and not performing the begin overlap if you are). I'm on 4.19 and this solution is not working for me. For some reason, the bones indexes seem to be scrambled. In particular, when I hit the head area with a projectile (static mesh), the overlap reports that "pinky_01_l" was overlapped. I'm using the Third Person SK. Bumping this. Same thing is happening for me in 4.19. Any solutions yet? Same here - suggested solution not working properly for 4.19. I've done some counting and what I've found is that the OtherBodyIndex returned by the overlap event does not account for all bones, but rather only bones that have a PhysicsBody attached to them, while the GetBoneName goes over the entire hierarchy and does not skip bones that do not have a PhysicsBody. It just seems both functions count the index in a different way, knowing this it is at least possible to guess up manually determine up front what OtherBodyIndex translates into which BoneName - this of course is a very (very!) temporary workaround and should be fixed. Yes, this was my conclusion as well when I had this problem. I tried looking through the source to determine how this was being used and unfortunately did not have good results -- I think the variable was an int32 called BodyIndex or ItemIndex and for me was very hard to understand its use. Does this problem persist in 4.18 or 4.20? Perhaps a bug report should be submitted. It seams that the bone name index has the same order of GetBoneNames() method, so I write a function to find all bone name with physic asserts, and use this array, you can get the currect bone name by OtherBodyIndex in ComponentOverlapBegin event. 1. Create a TArray PhysicBoneNames in my character(Or any actor owns the SkeletalMeshComponent). 2. Add a function GetBoneName(float BodyIndex) to return bone name in PhysicBoneNames array . 3. Call this method on your OnComponentOverlapBegin Event.